Consumer confidence in private labels has been growing, as more and more people recognise and buy such products, believing that their quality does not differ markedly from brand names, shows a consumer survey carried out in July 2016 on a representative sample of 602 adult Poles for the purposes of the report “Private label retail market in Poland 2016. Market analysis and development forecasts for 2016-2021”. Lower price is still the main reason why Poles go for private label products. Compared with the previous edition of the survey, the proportion of respondents saying that private label products are cheaper than the brand name equivalents or offer better value for money increased, from 62% in 2015 to 74% in 2016. Attractive pricing is considered particularly important by consumers aged 18-34 (57%) and 35-54 (59%), as well as by less affluent consumers (78% of respondents with net per capita income of below PLN 1,000). Older respondents, on the other hand, mainly point to quality of private label products (56%). Unsurprisingly, quality plays a key role for the wealthiest respondents (36%). Value for money is what matters a lot to twice as many men than women (25% vs. 13%) and more than four times as many persons aged 18-34 than respondents aged 55+ (25% vs. 6%). 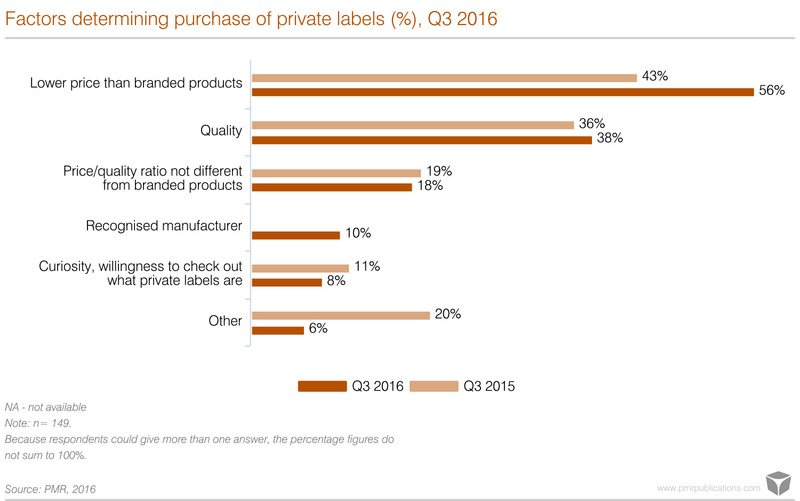 The proportion of respondents who buy private label products because of their quality increased from 36% in 2016 to 38% in 2016. One in ten respondents buy private labels offered by retail chains because they know the manufacturer. This factor is more important to men (14%) than to women (8%). Whereas most people who buy private labels are confident about the products quality, consumers who do not buy such products are of an opposite opinion. Concerns about the quality is the reason most frequently given by them for not buying private labels. Nearly 30% of such respondents explain that they only buy products which they have checked.